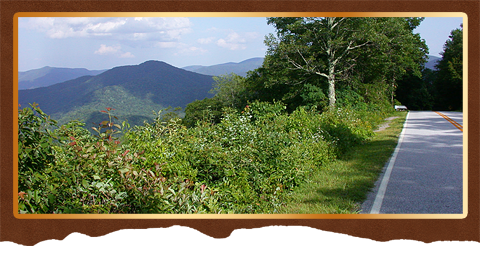 Located in the southern mountainous regions of Towns County’s Blue Ridge Mountains and forming a scenic drive loop is the Russell Brasstown Scenic Byway. In my personal opinion this is a four star, 40.6-mile, 360-degree view of what the wilderness lands of central North Georgia’s Chattahoochee National Forest has to offer in all its glory. Tall mountains with endless vistas, rushing creeks and waterways, an abundance of waterfalls, miles and miles of hiking trails including the southern most section of the Appalachian Trail. Camping, biking, fly fishing, picnics, natural wildlife, and wildflowers all in a land where mysterious ancient legends of other worldly beings tell their tales and show their wares in a mountain setting like none other. The Russell Brasstown Scenic Byway takes in more natural wonders per mile than any other scenic route in North Georgia. This route will take visitors from the depths of the valleys to the heights of the tallest most accessible mountain in Georgia. Though beautiful to behold the steep climbs and descents along the routes paved 2-lane and often 3-lane roadways can be a little intimidating to some inexperienced mountain drivers. Yet it’s a paradise roadway to others that are familiar with the curves and up and downs of mountain roadways. For those with less mountain driving skills, its advised to take your time, pull over when you can do so safely, so that you can see the sights or just let the pushy traffic behind you pass you by. Also when going down steep slopes its sometime advisable to take the transmission gear shift out of over-drive, and place it into drive or second gear to avoid excessive brake usage. Also, don’t let your vehicle exceed the speed limit to avoid constant braking. A couple of trips over the mountain and you’ll soon be a local pro-driver of skill or at least more experienced. This 40.6-mile scenic drive follows four roadways creating a loop. These four roadways are; GA17/75 to ALT75, GA348 to GA180, plus the access roadway to the top of Brasstown Bald just off of GA 180. This Highlander Mobi GPS location will take you south of the town of Hiawassee and begin at the intersection of GA17/76 and GA180. Please drive safely and have a great time.